North Dinajpur, despite being a lesser known district of West Bengal, is famous for still maintaining the age old traditional wooden mask dance called Gomira. The Gomira dances are organised to appease the deity to usher in the ‘good forces’ and drive out the ‘evil forces’. The dancers are all male, and portray one or many characters of human or animals. They dance to the accompaniment of musical instruments like Dhak and Kansar, but the most interesting aspect here is the total absence of any songs or chants. Traditionally, the Gomira dance starts with the entry of two characters Buro-Buri, who are actually the human forms of Shiva and Parvati. After the initial round of dancing, characters are called on to the stage. The last and perhaps the most powerful character is Narsingha-Avatar, symbolically showing the ultimate triumph of good over evil. An interesting feature of these dance performances are the trances or Bhor, as it is known in the local language. 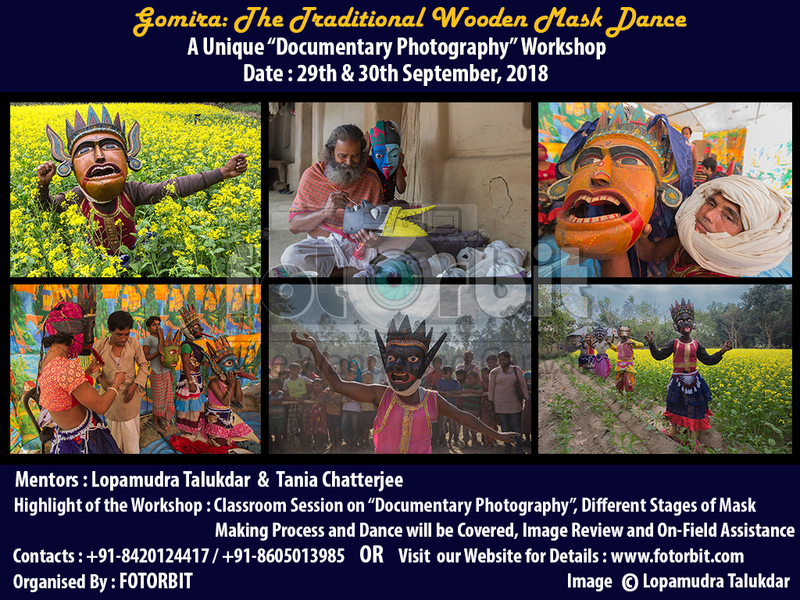 The wooden masks which is the most interesting and attractive part of the Gomira dance have emerged as a small scale cottage industry in this region. These masks are used as home decor nowadays. The craft itself is developing with the exposure to the outside world influences and the craftsman’s’ changing it as per the requirements. Historically the masks were made from very good quality wood, but these days cheaper wood such as mango, pakur, kadam, gamhar are used to cut down on the cost. Unfortunately, the Gomira dance form nowadays is a dying tradition and under-appreciated. Apart from photography point of view, another objective of this workshop is to support the local artists and an effort to make this traditional art form more acceptable. Day 1 (29th Sept, 2018) :Morning session will start by a short introductory session and briefing of 2 day’s program. 9am to 12noon shoot with Gomira dancers with their huge colourfulmasks, back stage preparation of dancers and some portrait shoot with different colourful masks. After lunch, we will have a review session and by 5pm we will pack –up and end of the 2 days workshop. Shared double/triple bed room (same gender participants) in a standard clean hotel with attached bathroom.Please note, its an off-beat location and we will try to provide you the best avaliable accomodation and food. For separate room extra charge is applicable. All local transports related with our workshop like from railway station to hotel, village visits and drop to station. Train/flight/bus tickets to and from shoot location, North Dinajpur. Any additional food items or beverage apart from meals. Any personal habit or expenses. Anything that not in “Include” list. All itineraries are sample itineraries, intended to give you a general idea of the likely trip schedule. Numerous factors such as weather, road conditions, local political situations, the physical ability of the participants etc. may dictate itinerary changes either before the tour or while on the trail. We reserve the right to change any schedule in the interest of the trip participants’ safety, comfort & general well being. FOTORBIT shall not be responsible for any delays & alterations in the programme or expenses incurred – directly or indirectly – due to natural hazards, flight cancellations, train delay, accidents, breakdown of transport, weather, sickness, road blockages, political closures or any troublesome incidents. FOTORBIT shall not be responsible for any loss, injury or damage to person, property, or otherwise in connection with any accommodation, transportation or other services, resulting – directly or indirectly – from any act of GOD, dangers, fire, accident, breakdown in machinery or equipment, breakdown of transport, wars, civil disturbances, strikes, riots, thefts, pilferages, epidemics, medical or custom department regulations, defaults, or any other causes beyond our control. FOTORBIT do not have any insurance policy covering the expenses for accident, sickness, loss due to theft, or any other reasons. All baggage, camera, other gears & personal property/s at all times are at the client’s risk. I am interested to be a part of this photographic workshop. Let me know the railway route. Interested, but how how to book?